Technically, lentil is a type of legume (pulse) plant and its edible dried seeds. Lentil is commonly known as Masoor and has botanical name Lens culinaris. However, in the culinary world, the word “lentil” is also used for the whole family of legumes or pulses that include; masoor, chana(split chickpeas), toor, urad (see my last post of urad and jimbu) etc. In Indian subcontinent, lentils, which are commonly known as dal, are one of the quintessential food items and the biggest source of protein. 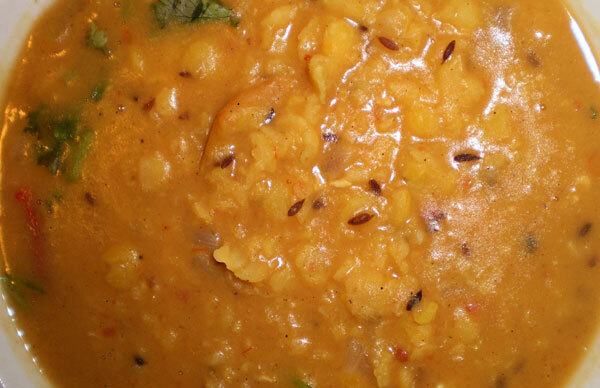 It is usually prepared as a soupy stew like dish also known as dal and served with rice or flatbreads. A few years into my graduate school, I bought a small Crockpot from Wal-Mart (couldn’t resist $9.99 price). I used it quite often because I lived in a dorm with a shared kitchen. Lentil soup was my default meal to cook in this new culinary toy. I would leave some lentils, usually from Safeway from across the street, water, knick knacks (hint — leftovers) in morning. When I came back in evening, I had hot lentil soup ready. I experimented with different type of “lentils”, different knick knacks and spices. My lentil soup was, in essence, adaptation of Indian subcontinental dal. My favorite is chana dal because it produces creamier, thicker and most flavorful soup. However, chana dal was not available in Safeway and needed a special trip down to an Indian grocery store in Virginia. This ritual went on couple of times a week for more than a semester until the dorm management confiscated my Crockpot. The official reason was that it was a fire hazard but I believe that they really wanted my lentil soup. I miss my Crockpot. But now I have learned to make lentil soup without it. Here are my recommendations for making the best lentil soup with or without a Crockpot. Throw out the extra water. Add same volume of filtered water as the soaked bean. Start boiling on medium-high heat. You can substitute some water with chicken stock for more flavorful soup. Do not add anything until lentil soup starts to boil. Depending on type of lentils and presoaking, cooking may take anywhere from half hour to an hour and change. It’s nearly impossible to overcook lentils. However, it is easy to burn them. So after boiling reduce heat to medium or medium low. For yellow lentils, I recommend only one spice; whole cumin seeds. The whole cumin seed (not the powder) blends with yellow lentil in naturally aromatic and tasteful way that I have not seen with any other spice. 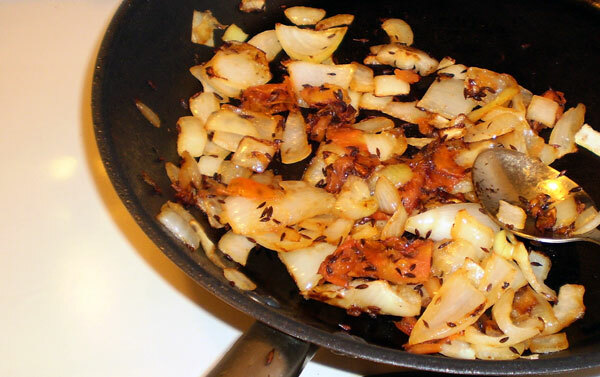 Fry whole cumin in ghee (or butter) until you get dark brown color. Add a pinch of cumin seeds per cup of lentil soup. Beside whole cumin, I would recommend chopped sautéed shallots or onions (even dried onion powder works), tomatoes, and butter as flavors. Cilantro is an excellent garnish after lentil is cooked. A very few drops of lime juice also enhances the flavor but don’t add it if you are already adding acidic ingredients such as tomatoes. Other flavors you may add or substitute are roasted garlic, green chilies, asafetida (if adventurous). Traditional north Indian dals don’t have any other ingredients except few seasoning but south Indian dal often has lots of vegetables. If you are making a lentil soup, I wholeheartedly recommend you to add other ingredients. For each cup of cooked lentil soup, do not add more than ⅓ cup of other ingredients. My favorites are commercial frozen meatballs (both Costco’s and Ikea’s), cooked pieces of meats, any veggies, rice, broken pieces of pasta, etc. My favorite veggies to add are; cut pieces of broccoli, green peas, mushroom, and zucchini. The idea is to add anything you want to eat or anything you have on hand. Be a lentil artist here! My suggestion is not to add too many ingredients at once because it’s going to confuse your palates. Don’t add more than one ingredient from each category of meat, vegetable and starch. Once a friend of mine hated the flavor of his lentil soup recipe I gave him. Finally, I discovered that he didn’t put enough salt. Salt is probably the most important flavor in your lentil soup. Alright, technically it brings out the flavor of lentil soup. Don’t forget to add tasteful (and healthy) amount of salt. Just changing the amount of salt can drastically change lentil soup’s flavor. My recommendation is not more than ½ teaspoon of salt per cup of cooked lentil. Gradually add salt, taste the lentil soup, and calibrate amount of salt you want. Lentils maybe a healthy food but you will notice that like any other soup it’s high on sodium. Really nice blog, Doc! I think I should try buying a crockpot too! By the time they are ready to confiscate it, its time for me to leave too! I love cooking, but I have never used a crock pot. I want to buy one so bad but I have no room for it right now. I never thought to buy whole cumin seeds I just buy the ground up ones. I’ll have to look for those!